There are several collections of tutorials here on iBookBinding. Some of them proved to be quite useful and became popular in the bookbinding community. As you can see, all of them are dedicated to bookbinding process in whole. Today we are discussing something different. All tutorials in this collection are dedicated to one small (but very important) part of the book — endbands. Endbands (headbands and tailbands, if you describe elements at the top and bottom of the book block, respectively), are often overlooked by the ordinary book users. However, they are a very important element and can become a part of your design. There are some hints that endbands were already used in the first known multi-quire Coptic bindings. However, we cannot be sure that remnants of threads on the oldest codices are as old as the books themselves. At any rate, endbands were an integral part of books for many centuries. That gives us a wide choice of techniques and different styles to use on your bindings. 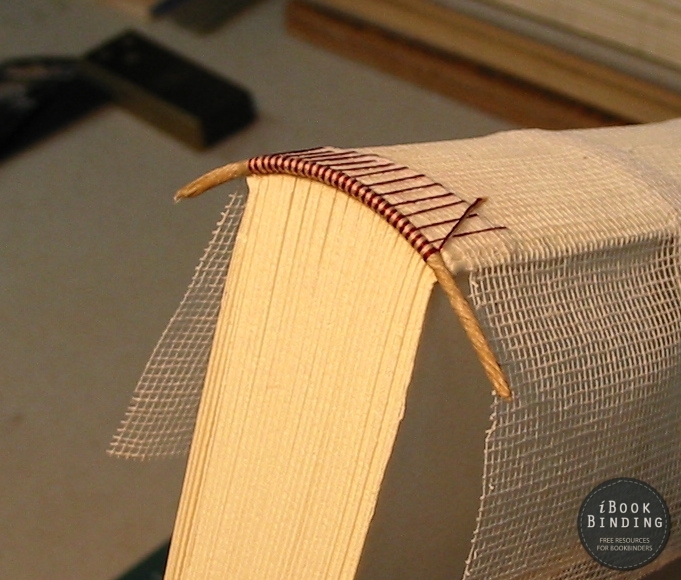 Traditional endbands are sewn on the quires of the book. For the case bindings, faux endbands on a cloth strip may be used (bookbinder glues them at the top and bottom ends of the spine). Sometimes pieces of leather or cloth or even paper may be used as endbands. Let us start with a tutorial published here on iBookBinding a year ago. Traditional technique with one bâtonnet (core). Arguably the easiest one. Coptic endbands could be made in many different styles. Here you can find instructions on making two different types of Coptic endbands. Tutorial is in Spanish, but the photos are self-explanatory and you can always use automatic translation in your browser if you need some additional comments. If that’s not enough, you can check this video tutorial in six parts. I’m not sure I like the style, but it will help you get the idea. This style of binding (and making endbands) was introduced in the Late Middle Ages. The important difference of the technique is that you have to make the primary endband that is oversewn with colored threads later. The result can prove to be spectacular! You can give your book a creative touch by using an Islamic endband instead of some standard European styles. I have found several tutorials on Islamic endbands but this one looks more detailed than others. If you are into historic reconstruction, this tutorial may be of use to you. You can find a brief instruction on making a Byzantine codex here. Couple of pictures are showing how the endbands should be made. I just love V for Books posts. They are quite instructive and you get enough (not many) photos to illustrate the process. That should compensate for the missing pictures at our own tutorial listed in the beginning of this publication. This is a completely different approach to making headbands. You can make them out of pieces of leather or even cloth. Here you can find a Carolingian style endband (that also works as a tab). Another type of medieval endbands that is supposed not only to attach quires to each other, but to sew them to cover boards. More often than not modern headbands are glued and not sewn on the quires. It would be a mistake not to give at least one tutorial on making faux endbands. The one important tutorial missing here is classic French endband sewn on two cores. You can find some nice examples on Lili’s Bookbinding Blog. You can also find some instructions in this black and white pdf. Some pictures for the inspiration.